TEHRAN, Iran (AP) — Iran’s foreign minister denounced Israeli Prime Minister Benjamin Netanyahu’s allegations against Tehran at the U.N. General Assembly as an “obscene charge,” the state-run IRNA news agency reported Friday. The response came after Netanyahu on Thursday claimed at the General Assembly that Iran has a “secret atomic warehouse” on Tehran’s outskirts and challenged U.N. inspectors to examine it. It was unclear whether Netanyahu’s announcement sheds new light on what U.N. inspectors already know, or whether it was intended to prove that Iran has been violating the landmark 2015 nuclear deal with world powers that followed years of Western sanctions over the country’s contested atomic program. Netanyahu is known for showmanship at the U.N. General Assembly. In 2012, he famously held up a cartoon of a bomb before the U.N. audience while discussing Iran’s nuclear program. Netanyahu made a similarly splashy accusation in May, saying Israeli agents spirited away a “half ton” of documents regarding Iran’s nuclear program from a facility in Tehran’s Shourabad neighborhood. 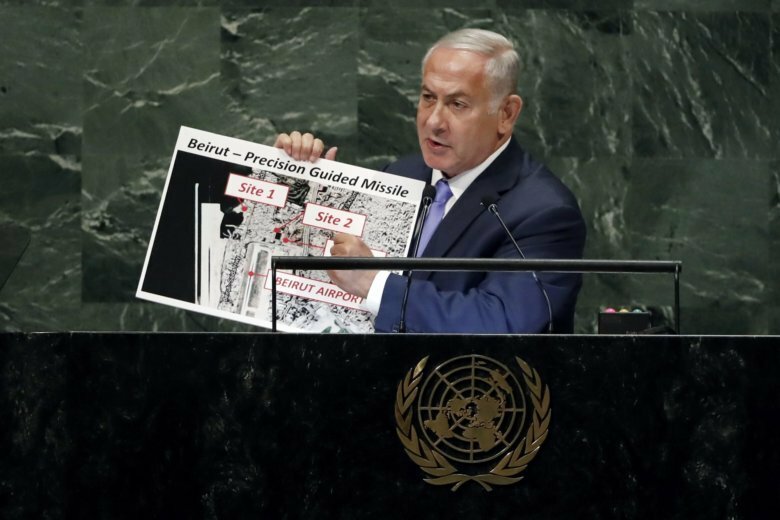 Separately, Netanyahu in his speech before the General Assembly also held up an image of what he said are rocket factories run by the Iran-backed militant Hezbollah group, hidden in civilian areas of Beirut. The Israeli military had said Hezbollah is attempting to establish missile conversion infrastructure near Beirut’s Rafik Hariri International Airport. Last week, Hezbollah’s leader Hassan Nasrallah boasted how the Shiite militant group now possesses “highly accurate” missiles despite Israeli attempts to prevent it from acquiring such weapons. He did not elaborate on the missiles. A Hezbollah spokesman in Beirut said Friday the group has “no comment” on Netanyahu’s claims. “We will only say that the resistance (Hezbollah) has capabilities that” Nasrallah talked about.